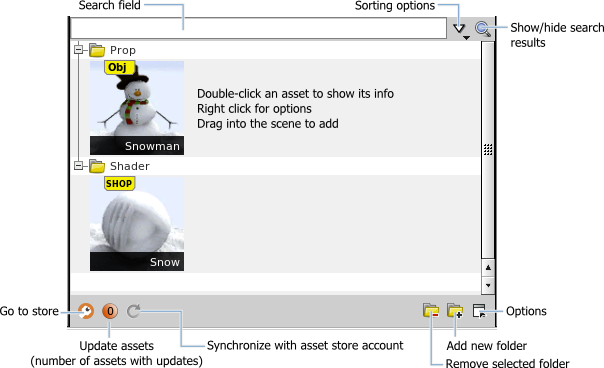 The Asset Browser pane allows you to manage the assets you have downloaded from Orbolt. Drag the asset from the Asset Pane into the 3D Viewport. Select the folder you want to delete and click . Hold on the asset and drag over the name of a folder. Make sure the name of the folder is highlighted before dropping. You can click to open the Asset Browser Preferences and decrease the Icon Size to make dragging and dropping easier. Type the name of the asset in the Search field. You can click to show or hide results. Choose from one of the sorting options in the menu. Click to open the Asset Browser Preferences window. The orange number button in the lower left corner indicates if there are any assets that have updates. Click the button to update assets. You can view the asset change logs and update assets individually. Open the asset store in a browser window. You can drag an asset from the asset browser pane to the shelf to a create a tool.